One hundred wands that are guaranteed to make your players roll their eyes! Wand of Dis Guy’s Elf: Summons a house elf. Original owner may be annoyed. Wand of Guys: Summons 1d4 guys. They are very confused about how they got there. Wand of Greataxe: Summons a greataxe. Everyone make a Dex save! Wand of Hecks: The target can only use PG swearwords for 1d4 hours. Oh, fork! Wand of Wave: Conjures a wave that crashes against the target (must make a Dex save or take 2d6 bludgeoning dmg and be moved 20ft backward). Wand of Wave: Conjures a spectral hand that waves enthusiastically at everyone for 1d4 minutes. Wand of Massage: The wielder feels relaxed and their tension headache is, like, totally gone! Wand of Speak With Pants: Exactly the same effect as Speak With Plants. Except it’s pants. Wand of Frog Cloud: You create a mass of airborne frogs in a 20-foot radius centered on a point of your choosing within range for up to 1 hour. Wand of Drying: All the wielder’s clothes feel fresh out of the dryer. Wand of Lying: The wielder is incapable of telling the truth for 1d4 hours. 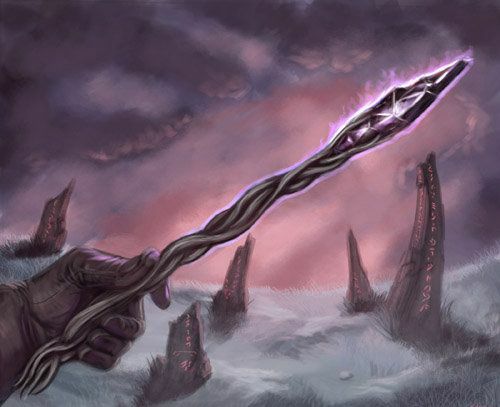 Wand of Free Action: You can use this wand to take one additional action on a single turn. Wand of Free Action: You’re not a number, you are a free character! Nobody can tell you what to do! Wand of Detect Thots: The user knows the location of any promiscuous women within 1d4 miles. Wand of Cone of Cole – summons 1d2 + 2 people named Cole. They are assembled in a cone shape, and disappear after 5 min. Wand of Portable Ram: Conjures a pocket-sized adult male sheep. He is adorable. Wand of Sticky-ness: Wand transforms into an ordinary stick. Wand of Prestidigitation: Has one charge of Prestidigitation. Wand of Pestodigitation: Choose one – create smell of pesto, flavor up to 1 cubic foot of nonliving material pesto flavor for one hour, or make the recipe for pesto appear on an object or a surface for 1 hour. Wand of the War Mage: You gain +1 to your (spell) attack bonus and ignore half cover when attacking. Wand of the Warm Age: Can alter time for a 1′ cube area. When activated (one charge), a time dilation field is produced. Over the span of one minute, the interior experiences 3 months of time, and is kept at a uniform 85 degrees F.
Wand of Healing: Restores 2d6 + 2 HP. Wand of Heeling: charms all canine targets in a 30 foot radius. Wand of Heal -Ing: restores 4d4 + 4 HP, but only to targets that end in -ing, be it name or creature (halfling, wyrmling). Wand of Silence: Summons Specter Librarian who shushes anyone who speaks. Will attack anyone talking over a whisper after a few warnings. Librarian will not leave unless you sign up for a library card. Wand of Burning Hams: Summons 2d6 flaming hams that are flung at the target. Target must make a Dex save, taking 3d6 fire damage on a failed save and half as much on a successful one. Wand of Earning Hands: Gives the wielder advantage on Sleight of Hand checks for 1d4 hours. Wand of Cowhide Boots: Summons a pair of boots that give the wearer +5ft of speed. Wand of Cow Hide Boots: Cows and cow-like creatures become invisible to the wearer. Better hope you’re not fighting a minotaur! Wand of Invisibility: Casts Invisibility… on the wand. Wand of Cure Light Wounds: one charge of Cure Light Wounds. Wand of Find Steve: The caster must make a DC 10 Perception check to see a man named Steve nearby in the shadows. He seems ready to help do what he can. It is never clear whether Steve was summoned by the spell or just happened to be there at the right time. Wand of Hold Person: a human man appears before the target, spreads his arms, and hugs them firmly yet tenderly. Wand of Old Person: the target ages to a venerable age for their race. Wand of Turn Undead: turns the target undead. If already undead, they turn into a different type of undead creature. Wand of No Ledge: a random ledge in a 50 foot vicinity disappears. Wand of Gnoll Edge: summons a snarky gnoll dressed in black leather with spiked hair. Wand of Crone of Cold: summons any old lady who laughs knowingly before disappearing in a burst of ice. Anyone within 15 feet must make a Dex save or take 1d6 cold damage.